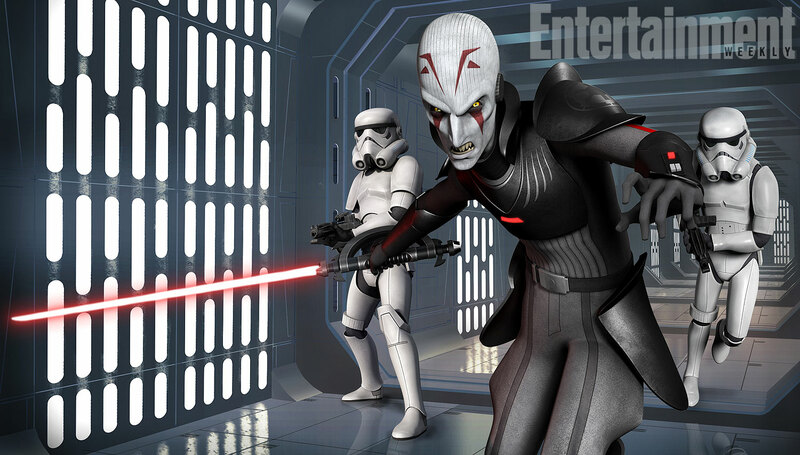 The latest issue of Entertainment Weekly has a spotlight on Star Wars Rebels for it’s Fall 2014 TV preview, and while there is no new information revealed, we did get a cool new image of the Inquisitor and some Stormtroopers. You’ll notice the hilt of his lightsaber is a bit different from the previous images we’ve seen of him, where there were two handles on both sides of the hilt to form a round shape, but in this image there is only one. Pablo Hidalgo spoke about this by saying, “It’ll make sense once you see it in action.” So I guess we’ll just have to wait and see to what the Inquisitor is fully capable of with his lightsaber until we see him in action for the first time.